Explaining what Soube does is very simple: it is a music player that, obviously, plays music. Everything about this application is simple. Installing it is simple, figuring out the minimalist interface is simple, accessing the equalizer is simple, picking a music folder and playing music is simple. So if you’re looking for a user friendly music player with a minimalist interface, you’re very well advised to get Soube. Some people have a PC, others have a Mac, and some prefer Linux. No matter what operating system you’re running on your computer, Soube has you covered. This music player is available for Windows, Mac and Linux. The first time you run Soube, it will ask you to select a music folder. To do so, you must first click the cog icon from the upper right hand corner, then you must click the Music Folder button and pick a folder that contains music files. Soube can handle MP3, WMV, WAV, as well as OGG music files. As mentioned above, Soube has a minimalist interface. The main panel lists the audio tracks from the music folder you selected. At the top there’s a panel that features playback buttons. Once you select a song for playback, the aforementioned panel will display some info about that song: name, artist, and album. Soube supports keyboard shortcuts. Ctrl + F brings up a search bar. Ctrl + Up pauses the playback. Ctrl + Right skips to the next song while Ctrl + Left goes back to the previous song. Ctrl + Down enables/disables the shuffle function. 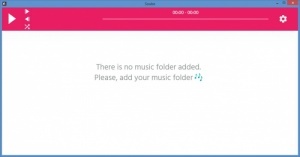 Soube proves that music players don’t need to be complicated. Soube has a minimalist interface, can handle several types of audio files, supports keyboard shortcuts, and does precisely what it was built to do: play music. Soube is available for Windows, Mac, and Linux. Soube has a minimalist interface that’s very easy to use. Soube supports MP3, WMV, WAV, and OGG audio files. You can perform several tasks by using keyboard shortcuts. Soube’s taskbar icon features playback controls. Soube is free software. Detailed documentation is available online. You can download Soube free here.